October is Pit Bull Awareness month, and it’s an important time to educate people and spread the word about this breed. There are plenty of misconceptions and stereotypes about Pit Bulls, and it seems like every other day there is a story in the news about a Pit Bull gone bad. Those stories get plenty of ratings, but they add to the negative press already surrounding Pit Bulls. When raised in a positive environment with lots of love, Pit Bulls can do some amazing things. The Pit Bulls in these stories all went above and beyond to heroically save their owners’ lives when no one else could. When the Daniels family adopted Ember from a rescue organization, they had no idea that she would become so attached to her human brother, Tre. She loved her 10-year-old boy and slept at the foot of his bed every night. But one evening, Tre’s mother woke to Ember making an odd sound. She had left her comfy place in Tre’s bed and was pacing. Mrs. Daniels knew something must be wrong, so she followed Ember. The pup led her to the bathroom where Tre’s feet were hanging outside of the bathtub. Tre had suffered a seizure and fell back into the tub. Thanks to Ember’s quick action, Tre was rushed to the hospital and got the medical attention he needed. When he got back home, Ember refused to leave his side. That’s a loving pup! Justin Becker was taken off guard when a burglar posing as a delivery worker tried to enter his home. Justin tried to fight off the attacker, but the man pulled a gun on him. That’s when Kilo, Justin’s Pit Bull, sprang into action and attacked the burglar. The gun went off and shot Kilo in the head before the man disappeared. Justin held Kilo in his arms, thinking that this might be the end. But he refused to give up and let Kilo die. He rushed the pup to the veterinarian. After a quick x-ray, the vet determined that the bullet never penetrated Kilo’s skull, and Kilo would live. The vet said it was a “one in a million” chance that the gunshot wouldn’t kill the dog. Kilo managed to take a bullet meant for his owner and miraculously survived. On a dark night, a train engineer noticed something on the tracks ahead of him. A Pit Bull was frantically trying to drag a person off of the tracks. The engineer slammed on the brakes, but he couldn’t stop in time. While Christine Spain got away unharmed, the dog who had saved her life, Lilly, was hit by the train. Spain’s son had rescued Lilly and given the pup to his mother in hopes that it would help her cope with alcoholism. But on the night of the accident, Spain passed out on the tracks on her way home. Lilly suffered massive injuries, but stayed by her owner’s side until help arrived. The pup underwent major surgeries and lost one of her legs, but she eventually recovered. Her love and loyalty for her owner came before her own safety like a true hero. Elliot Nerland was walking around his living room one morning while his wife, Erin Daly, slept in the bedroom. Suddenly, he collapsed on the couch while suffering a heart attack. That’s when Sweet Dee sprang into action. 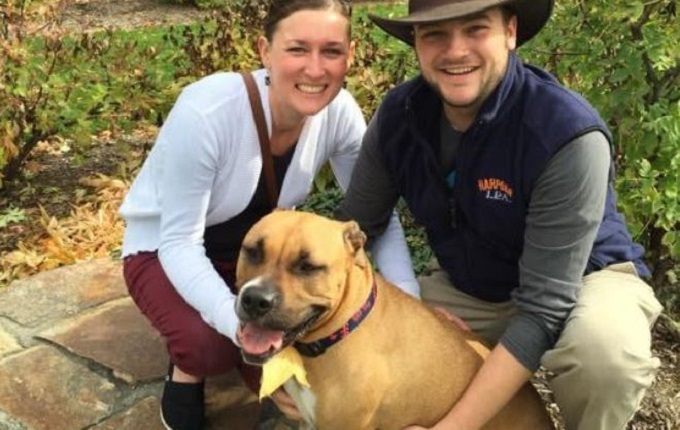 Nerland adopted the Pit Bull when she was a pup from a rescue organization, but it was Sweet Dee’s turn to rescue her owner. She ran to the bedroom and barked and jumped on the bed. Daly knew something was wrong, so she followed the Pit Bull into the living room where she found her husband. She immediately began CPR and called 911, saving Nerland’s life. If it weren’t for the lifesaving pup, Nerland may not have gotten treatment in time. But the rescue pup became the rescuer and saved the day. Rhonda and Evelyn Westenberger woke to Baby the Pit Bull jumping on them and barking. They knew something was horribly wrong when smoke filled the room, so they hurried to get outside. By the time they made it out, the fire was already out of control. If Baby hadn’t woken them up, they probably wouldn’t have been able to get out in time. But Baby wasn’t done with her rescue efforts. She dashed back into the burning home to save the five other dogs who were trapped inside. She led them out of the flames and even grabbed one scared pup who was hiding under the bed and dragged them by the neck to safety. Baby managed to save her whole family, humans and pups alike. Please help spread the word that Pit Bulls are sweet, caring dogs that just need loving homes, especially during #PitBullAwareness month! Do you have a story about a loving Pit Bull? Let us know in the comments!